With an internationally fixed price, an infinite market and being a small volume end product, the pluses for gold relative to other metals are strong. What is normally not appreciated is just how simple it is to recover this shiny prize in in the majority of cases. Yes, we all know about deep level refractory sulphides, but there is a vast resource of low hanging fruit to exhaust before going there. Gold’s principal attribute that separates it, literally, is the very high SG of 19.2. Relative to its typical quartz ore host at an SG of 2.7, this is a huge differential to prey upon, and even if other sulphides or heavy minerals are present these rarely exceed an SG of 7, so this makes for great gravity separation potential. The next favourable attribute of gold is that even at modest grinds it is liberated as free metallic particles, resulting in a disproportionately high amount becoming available for capture. Gold is malleable, so it does not shatter upon grinding, as do some brittle minerals that become far finer that their host. This turns them into difficult targets for physical separation processes. In fact gold retains its liberated mass well and mostly what occurs is flattening and alteration of shape. Putting all these attributes to our advantage allows the design of a simple process that maximizes the liberation of gold in as coarse a size as possible so that huge SG differential can be used to full advantage. The original ore breaks on the planes of weakness, which corresponds to the mineralization grain boundaries - we call this ‘early liberation’. We at APT have put a good deal of investigation into optimizing impact crushing as the mechanism of choice for oxide or quartz hosted ores. In fact impacting looks to have advantages for even deep level sulphide ores where both the sulphides and any free gold liberate well. Apart from the metallurgical advantage of early liberation, impact devices are small and compact and have a high reduction ratio. For example, with APT’s RD15 impactor, particles of up to 40mm are fed, resulting in a product with an 80% passing size of about 350 microns. The resulting product often yields a very high proportion of the gold in the primary gravity concentrate, see the progression of photographs below of an actual ore. Putting this principle into a practical plant package has been achieved by APT’s design team to result in gold recovery plants of various throughputs from 1.5 tph through to 12tph, and beyond. The RD15GK pictured above is an inexpensive starter pack that allows a prospective miner to get moving with professional equipment that has been purposely designed and built to the same standards as our larger plants. There is no compromise in quality on the RD, which is built in our own workshops. Being relatively light and compact the plant can be brought into production fast and can also be easily re-located. A small pre crusher as well as post cleanup and smelting packages are also available to complete the package for ore-to-gold capability. 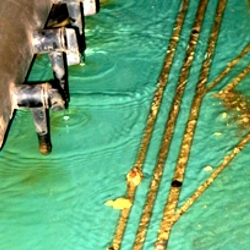 Certainly there may be more gold to extract by the addition of downstream plant, like APT’s TriTank cyanidation system for example, but that can always follow as a subsequent phase when the simple starter plant has provided the cash flow. APT can provide amenability testing to assess the performance of your ore in our RD impacting system upon as little as 50kg of sample. We also provide the service of a pilot RDGK for recovery from 1 tonne ore samples, which the client is welcome to attend. APT has therefore removed the obstacles to a fast and reasonable entry into gold production with professional, reliable equipment. All that remains is to implement and reap the golden rewards.